NEW ORLEANS – A 67-year-old woman who attended a Pelicans game in March of last year is suing the team and the Smoothie King Center after she was allegedly struck and seriously injured by another fan trying to catch a t-shirt. Mercedes White filed suit against the State of Louisiana, The Louisiana Stadium and Exposition District, SMG Holdings Inc. and New Orleans Pelicans NBA LLC in the Orleans Parish Civil District Court on March 23. 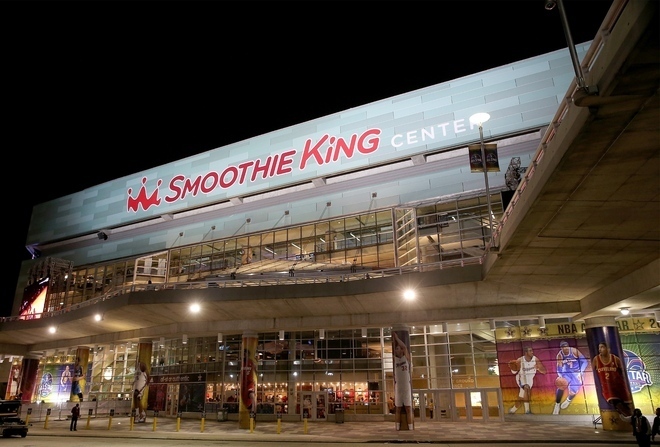 The plaintiff asserts that she was an attendee of the New Orleans Pelicans' game at the Smoothie King Center on March 25, 2014. During the traditional t-shirt toss during a break from the action, White alleges that she was struck below her right eye by an errant fan hoping to catch a t-shirt and suffered serious injury. The plaintiff states that the impact caused shock to her optical system, broke her dental bridge, and caused further injury to her eye, face and mouth. The defendants are accused of negligence in causing White's injuries by riling up the fans and encouraging wild behavior in pursuit of the t-shirts. The plaintiff seeks an unspecified in damages for damage to her dental bridge, medical expenses, physical pain and suffering and mental anguish. The plaintiff is represented by Christopher M. Gaffney and Michael G. Gaffney of Hundon & Gaffney and Charles V. Cusimano III of the Metairie-based Cusimano Law Firm PLC.